There are a handful of different ways to create a patch in Patchbord. You can start from scratch by pressing the Add Patch button in the top right or the + buttons next to unlinked tracks in the Project view. As an example, here we are duplicating the Basses Core Techniques patch in our catalog which we created to accompany the Spitfire BML Strings patch in Kontakt. The patch’s name is for display in Patchboard only. Often times, we use shorthand notation in track names because we’re trying to pack a lot of information in. The track may be named something like ‘Spfr BML Vln 1 Core’. Instead, we can use a friendlier name. The patch has specific metadata fields for the developer and library (see 2) so a good patch name might be something simple, like “Violin 1 Core Techniques”. 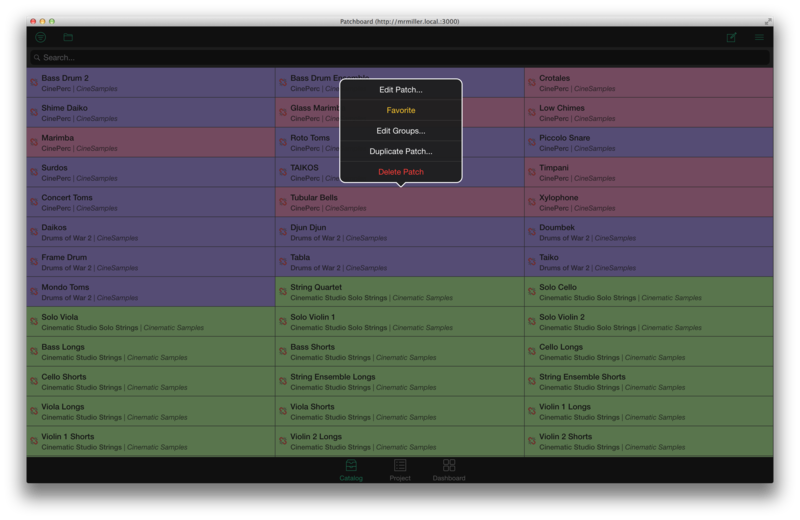 Patchboard uses the track name to link its patches to the tracks in your project. The track name should precisely match the name of the MIDI or instrument track which actually triggers the sounds. In this case, that’s a MIDI track connected to Vienna Ensemble Pro hosting Kontakt. The color of the patch as shown in Catalog and Patches views; purely cosmetic. Whether this patch is a favorite and used often. Can also be changed in the Catalog and Patches views by clicking on the star. Metadata is used for cataloging and organizing patches. You can use it to quickly find all the patches by a specific developer; from a single library; or on a particular instrument. Groups are like playlists in iTunes. They are user-defined collections of patches. You could group all the patches you use frequently on a specific project, for ease of access. Or make an “Epic Percussion” group that holds all your favorite patches for larger-than-life drums. A patch can be in as many groups as you like. The instrument(s) contained within the patch. In this case, it’s just basses but it could be multiple instruments. The patch may be for a mixed ensemble or it could be a percussion patch with multiple different percussion instruments spread across the keyboard. Tags are general metadata, used to either describe the timbre, texture, playing style or other miscellaneous details that don’t fit the other categories. For instance, you might tag your patch “Solo” if it were a solo bass patch. See 5 for more information on tagging individual articulation switches. Switches are how Patchboard handles articulation and mode switching for instruments. They appear as buttons in the Instrument Dashboard that trigger MIDI to control your instrument. When you add a switch or click on one to edit it, a side view opens up with the switch editor. Like the patch’s name, this is purely cosmetic. Unlike the patch’s name, it is optional and may be redundant with the tags in 5. The switch’s color as it appears in the dashboard. Each switch can have additional metadata describing it, usually things like Short, Long, Pizz or Sul Pont. describing how it’s played. Triggers define precisely how to activate this articulation or mode for the instrument. Usually that means pressing a MIDI key, sending a CC or a program change. 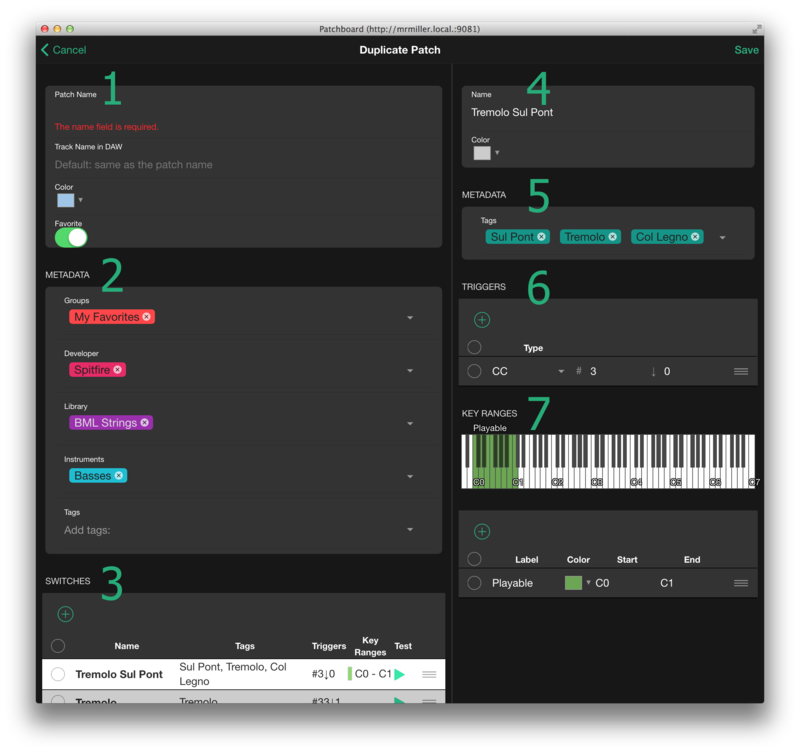 Each time you press the switch, those MIDI messages will be sent over Patchboard’s virtual MIDI cable to your DAW, through the record-enabled track and into your instrument. You can also send more than one MIDI message in sequence, e.g. a CC followed by a MIDI key. Key ranges are purely cosmetic but can be helpful visual aides. If you find yourself jumping over to Kontakt to look at the keyboard, this will be useful to you. You can add as many key ranges as you like in different colors and with labels. Percussion patches, for instance, often use only a subsection of the keyboard and often with gaps. You can use key ranges to show which areas of the keyboard are playable without having to bang on it to find out. If your patch has multiple different instruments in different ranges, you could add a key range for each and label them so you knew where to find the toms and the snares. Or if your instrument has a range of keys that do something special, e.g. a harp patch where one octave controls the key while another range plays a gliss in that key.